Linen sheets can seriously cut into the champagne budget, too. Happily, there is a middle ground. Especially if you live close to a very good antiques store. Our local antique mall has a vendor who sells beautifully pressed vintage table and bed linens. While I don’t mind having someone else’s monogram on our silver, the same doesn’t hold true for my bed clothes. That’s why I was very pleased to find two non-monogrammed pillow cases for a very reasonable sum. Nicely pressed, they let me enjoy the feeling of sleeping on linen and leave room in the budget for a couple of bottles of bubbly and some American sturgeon roe. And while I’m at it, here’s what I consider a brilliant idea for a business. Remember those cotton diaper delivery services? Wouldn’t it be great to have the same thing for bed and table linens? Once a week a truck would pull up and deliver a freshly pressed and starched set of bed linens and/or a tablecloth and an appropriate number of napkins. The used sets would be picked up, laundered and pressed ready to be returned the next week. Billing would be monthly and you would have the option of ordering more sets of whatever you need week-by-week. 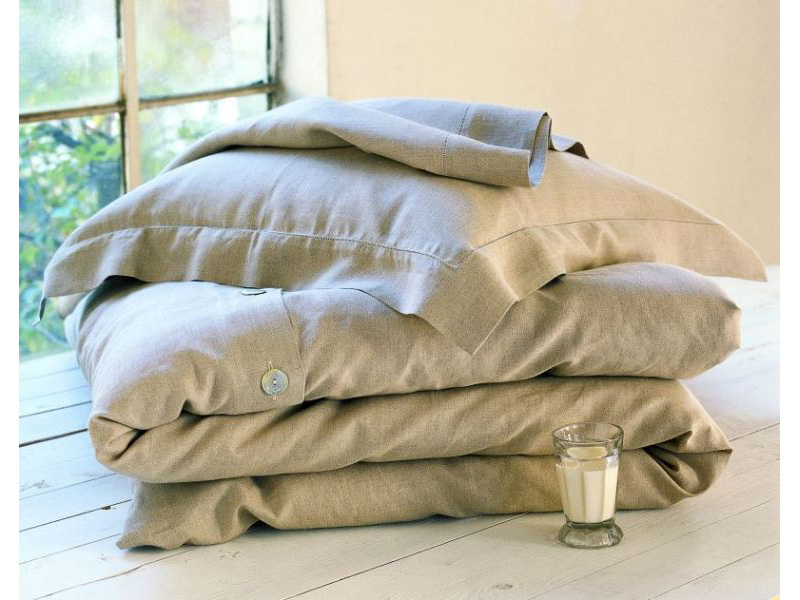 The Easy and Elegant Life Luxury Linen Home Delivery Service. Drivers in white peaked caps and black bowties, of course. This entry was posted in Living and tagged everyday luxury, linen bedding. Bookmark the permalink. What a wonderful idea! I love luxury linens. Perhaps you could expand to nice glassware as well? Who ever had enough on hand? Totally agree that buying vintage linens is the way to go, hands down, at least to supplement what’s on hand when a little luxury is in order (or desired). Years ago we stocked up on beautiful linen sheets and pillow cases that came from a large estate that were being sold for a song, some of them still bearing their paper labels so had never been used; the quality is amazing and I rather like the monograms as they are exquisite. We also found a banquet sized tablecloth that we pull out every now and then that has the most amazing Chinoiserie pattern — pagodas and mandarin, etc. ; it seemed expensive at the time but in my view couldn’t be purchased new today, at least not on our budget. I found an old linen sheet with some beautiful cut-work at a thrift shop for $3.00. It’s in perfect shape and I adore it. There’s nothing like linen. As a caterer friend used to say, and we had t-shirts make up with it, “Linen Makes the Party!”. LuLou, I’m all thumbs after a party and so beautiful glassware has a limited…. shelf-life. I think a service might make the cut. Just replace in the crate, spritz with the hose and leave for the service…. Reggie, that tablecloth sounds like a sound investment. As do your sheets. Isn’t amazing what one winds up using the most after initial misgivings about the price? Amortized over the life of the article, it is pennies a day to be surrounded by joy and beauty. A good example of living well, well within means! Fairfax, I had a friend who once suggested that my tattoo read: ” Born to cater.” (I, of course remain unmarked by all but the passing of time. Can you imagine the torturous hours in custody should one be so unlucky as to be detained?) T-shirts are the way to go. Lucky you with your thrifty find! I bought a set of bed linens in Hong Kong years ago. I used them once and realized the work involved. They felt great but since Mummy won’t send over Bridget to iron even my shorts, I gave up. I must confess… several years ago, while doing a sumptious bedroom for a client, I splurged and purchased a set of wonderful linen sheets. And it’s true. It’s all true. They really are the best thing ever. I do starch them , iron them, and spray them with linen water. It is worth it. It is all worth it. The “Charlie Chips” man delivered chips in great tins weekly, that was the extent of our snack, as a treat. Linen sheets are just that sort of treat all year. Our excel spread sheet, budget had me laughing – We had a “wine and diaper” budget when our twins were young, my husband figured he would need a glass after successful conquests of diaper changes. We had the cloth service with the sweet delivery man too. “They felt great but since Mummy won’t send over Bridget to iron even my shorts, I gave up” HA! Yes, that was me laughing out loud. My parents used to ask me what I wanted for Christmas every year. And for five years running, they got the same answer: a gentleman’s gentleman. Mrs. PvE, that’s living. My father-in-law had the beer truck delivery guy in Venezuela stop on his regular route and fill up the beer refrigerator! Pamela, somehow you’ve confirmed all my worst fears. I’m going to have to snap up another job or four… . Here is a link to a story one of my staffers wrote back in the day when I was a newspaper editor. A Milwaukee laundry service that does antique linens on a national basis. You mail them unless you are near a drop-off point. I know it’s not as nice as them stopping by to pick them up, but it’s a start. And the laundry tips in the story are good, too. You do know I meant to say “lavender” water don’t you? If you don’t have the time to go antique shopping for linens try this on line store, Elegant LinensPC com. They have great linens but they also have a clearance center for those of us who “want” luxury but don’t always have the budget. I will say though, the linens I have invested in are lasting beautifully. I feel like you can buy something quality once or poor quality a hundred times.